Is your favorite Italian American actor really of Italian decent, or just a convincing actor? Peter Falk, the dearly missed actor who played TV’s cunning inspector Colombo, used to do such an excellent job at imitating the Italian American sleuth that most TV viewers believe he was of Italian descent. In reality, Falk was Russian and Polish, with a mix of Hungarian and Czech further back in his ancestry. So, contrary to Falk’s public image, he was not Italian American, but a mixture of very hardy Eastern European stock. On the other hand, there are actors, who are of actual Italian heritage but, because of a changed name and the roles they choose to play, are rarely linked to their Italian ancestry. For example, actor Allen Alda, ‘Hawkeye’ of TV’s M.A.S.H. fame, was born Alfonso D’Abruzzo. When the actor’s father, Robert Alda, entered show business he changed his Italian surname to better assimilate into American culture. Actress Yvonne DeCarlo, ‘Lilly Munster’ of TV’s “The Monsters”, was born Peggy Middleton, but changed her average sounding name to the more exotic, Italian-sounding, Yvonne DeCarlo, which in fact was her mother’s maiden name. During the 1960s, when Jack Paar was king of late night television, he had, as a regular guest on his show, an Italian born golf pro by the name of Guido Ponzini. Audiences, especially Italian Americans, fell in love with the handsome and hilarious Italian golf pro from Salerno, Italy. Ponzini returned again and again to the show, week after week, the Italian community embraced the comedian with great affection believing him to be from their native land. Until it was revealed that the whole thing had been a clever ruse and the Italian golf pro was, in reality, Irish American comic Pat Harrington Jr. Harrington had all the gestures, mannerisms and the Italian accent down so well he fooled just about everyone, including Italian Americans. Mannerisms, images, and an association with a certain element of crime has influence how Hollywood selects the actors to portray their rolls. During the 1930s and ’40s, two of Hollywood’s popular dramatic actors were George Raft (George Ranft) and Edward G. Robinson (Emmanuel Goldberg), neither actor was Italian but they portrayed so many mobsters with ethnic surnames that fans mistakenly believed them to be of Italian descent. Another actor from that era was Italian American Richard Conte who chose to keep his original family name and, perhaps, because of it, and his dark ethnic looks, was typecast throughout his career as a street wise tough guy and mobster boss. He is best remembered for his work in Oceans 11 and The Godfather trilogy. One of TV’s most prolific actors, during the golden age of television, was Anthony (Tony) Caruso. During TVs western genre, Caruso, the son of Italian immigrants, was cast in so many Native American roles, that most TV viewers believed the actor to be a Native American actor. Anthony Quinn was a vintage Hollywood actor with strong, ethnic, good looks commonly believed to be Italian American. His work with famous director Federico Fellini, and Italian born actresses Anna Magnani and Sophia Loren added to that belief. In realty, Quinn was of Mexican-Irish decent. 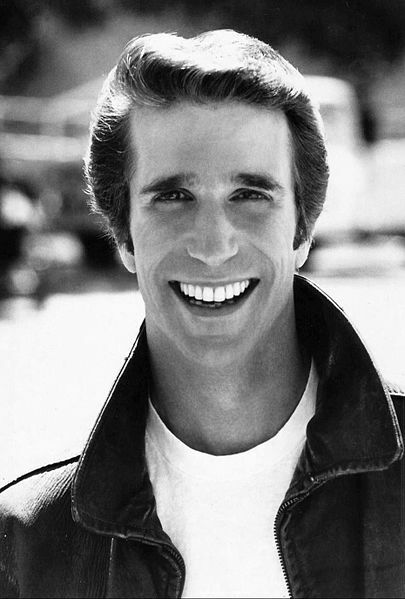 Henry Winkler did such a convincing job of acting like the cool, motorcycle riding Fonzie Fonzarelli on Happy Days, that fans believed him to be Italian. Truth is, Winkler couldn’t ride a motorcycle and he was no more Italian than Richie Cunningham. Actor Ernest Borgnine won an Oscar for his portrayal of a lonely Italian American bachelor in the academy award winning film, Marty. Borgnine, whose family names are Borgnino-Bonselli, has his family roots in Italy, but after Marty, perhaps afraid of being typecast, few of his roles reflected his Italian heritage. Most fans know him best as the comical Lt. Commander McHale from TV’s McHale’s Navy (1963-66). Richard Crenna‘s looks and name never typecast him. For that reason, few fans knew the actor was Italian American and that his parents came from Tuscany, Italy. His television character roles included Luke McCoy on TV’s The Real McCoys‘. And Walter Denton on the Our Miss Brooks series. But the role that brought him a unique cult following of fans was his characterization of Colonel Trautman in the film series Rambo, starring Sylvester Stallone. Stallone like many of the current actors chose to light up the marquee with his original ethnic name. The first famous Italian American actor to change his name for the screen was, of course, the great silent screen star Rudolph Valentino. Whose real name was Rodolfo Alfonso Raffaello Pierre Filibert Guglielmi di Valentina D’Antonguella. No matter his name, his dark Latin good looks were unmistakable and irresistible to female fans. Movie goers of the 1930s and 40s, put stars like Valentino high on a pedestal, for that reason common names had to be changed to attract fans to the box office. Today’s Hollywood is just the opposite of the old standards, they want to use ethnic names to create the illusion that their stars are just like the average guy or gal next door. Otherwise stars such as Ray Romano may have easily become Ray Roberts and Joe Mantegna Joe Martin. Years ago, many Italian American actors changed their family surname on the advice of their agents. Oscar winning actress Ann Bancroft was in real life born Anna Marie Louise Italiano. Penny Marshall, Lavern DiFasio of Lavern and Shirley , was born Penelope Masciarelli, Connie Stevens was Concetta, Robert Blake was born Michael Gubitosi, Nicolas Cage Nicolas Coppola, Vince Edwards was Vincent Zoino, Talia Shire was born Talia Coppola, James Darren James Ercolani, Rock star Madonna was born Louise Veronica Ciccone, and Dean Martin was Dino Crocetti. Even Italian actors and actresses got into the habit of choosing art names: Italian Actress Sophia Loren, a name that would leave little room for her co-stars on the marquee, was born Sofia Villani Scicolone. Hollywood has a large number of actors of Italian descent who have maintained their ethnic identity and achieved stardom despite having names that are not easily spelled or pronounced. Robert De Niro, Al Pacino, Sylvester Stallone, John Travolta, Leonardo DiCaprio, Danny Di Vito, Joe Mentegna, Dennis Farrina, Scott Baio, Susan Lucci, Annette Funicello, James Galdofini, Ray Liotta, Joe Pesci, Ben Gazzarra , Tony Franciosa and Danny Aiello. Unfortunately, there is one thing that all of these Italian American stars have in common, it is the fact that because of their strong ethnic names and facial features, they have not, and most likely will not anytime soon, be asked by Hollywood to portray the role of the President of the Untied States, or anyone else in high political office. Think about it: when’s the last time you saw an Italian portray the president of the United States? Hollywood still continues to typecast Italian looking actors in roles that are generally restricted to comedy buffoons, cagey detectives, pizza parlor owners, or mobster rolls. The rare exception to this rule came when actor Joe Mantegna was offered the role of Supreme Court Justice, Joe Novelli, on the TV series First Monday. However, that’s not really much of a stretch for Hollywood, since we’ve had examples of Supreme Court Justices with Antonin Scalia and Samuel Alito. Let’s hope this is the beginning of a new standard in media typecasting and that the American Italian actors will be cast in powerful rolls that inspire respect, and not fear, from America’s viewing audiences. And one day someone in Hollywood will finally have the inspiration to cast a prominent Italian American actor in the role of the President of the United States. Now wouldn’t that be interesting and very satisfying to a generation of hard working Italian Americans who has been waiting so long for their proper recognition?